The new Windows Live suite includes three different services for file storage and online synchronization. They are called Live Mesh, Windows Live Sync and Windows Live SkyDrive - all apps are available for free and you just need a Windows Live account to get started. Windows Live SkyDrive is an online file storage service similar to Box.net. 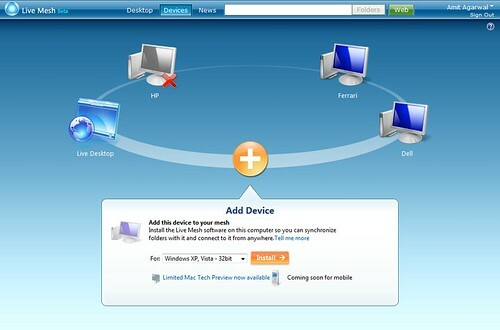 You can manually upload documents, pictures and other files to Windows Live servers via the browser and your uploads will remain accessible from any other computer or web-enabled mobile phone. Windows Live SkyDrive requires no installation and you get 25 GB of free storage space though the maximum size of an individual file / document cannot exceed 50 MB.� Each file or folder on SkyDrive has a unique Web address (URL), so you can easily paste that link into email messages or other documents for direct access. Windows Live Sync, formerly known as FolderShare, is a desktop app + web service that lets you sync files and folders across different computers. You can synchronize up to 20 folders containing up to 20,000 files each. Individual files cannot be larger than 4 GB in size. Say you have music files stored in your home computer�s hard disk and want to access this collection from the Office computer. Simply install Windows Live Sync of both the computers and add "my music" folder to your "personal folders" - now your entire music collection will be accessible from either of these computers. Windows Live Sync also lets you remotely access your files on the hard drive from any other computer via the browser without setting up synchronization. This is handy in situations like where you have to download a presentation from your work computer that�s saved on the desktop - just browse to the desktop folder via Live Sync website and download the file. 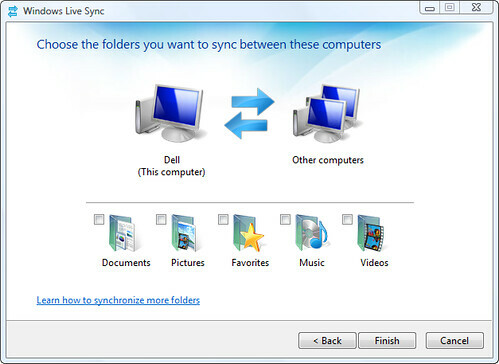 Other than online synchronization, Windows Live Sync also lets invite family members and colleagues (as readers, contributors or owners) to access certain folders on your computer though they will have to install the Live Sync software for this. Live Mesh includes everything that Windows Live Sync has to offer plus two extra features - cloud storage and remote desktop (with support for copy-paste). You first need to download the Live Mesh software and then select folders / files that you want to sync with other computers. The process is almost the same as Live Sync but here you can add folders for synchronization from Windows Explorer itself (right click any folder and click "Add Folder to Live Mesh") while Live Sync only offers a web interface to explorer. When you add any folder to Live Mesh for synchronization, a copy of that folder gets stored online so you will always have access to your files even if the main computer is offline. This service is known as Live Desktop and offers 5 GB of online storage space. Another important difference between Live Mesh and Windows Live Sync is Live Remote Desktop - Live Mesh lets you completely control the remote desktop just like other screen sharing application. You can even copy files and folders from the remote desktop to your local desktop through simple copy paste - copying folders manually is not possible in Windows Live Sync. Both Live Mesh and Windows Live Sync offer clients for Windows and Mac but you may also install Live Mesh on mobile phones running Windows Mobile 6.1 or later. Which Live Service is right for me? As expected, each of these Live services do have some overlapping features. Live Skydrive is for online storage, Live Sync is primarily for folder synchronization across computers (no storage) while Live Mesh offers a good mix of both though with limited storage space(5GB). Therefore my suggestion would be to go with SkyDrive as well as Live Mesh - you�ll get plenty of storage space plus remote desktop plus you can access important files from any other computer.